In stock -This product will ship today if ordered within the next 14 hours and 47 minutes. 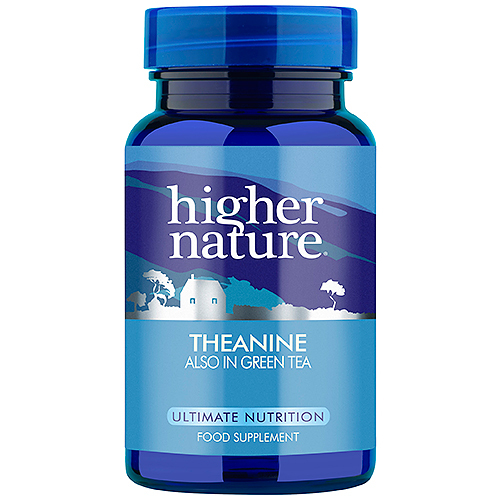 Theanine is a non-essential amino acid known to promote a relaxed and restful state, without diminishing alertness or causing drowsiness. In addition to supporting a sense of calm, contentment and wellbeing it can also assist mental alertness, learning and concentration. 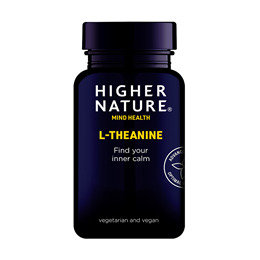 By maintaining levels of the calming neurotransmitters in the brain, such as GABA (gamma amino butyric acid), dopamine and serotonin, Theanine can help to balance mood and regulate emotion. It has also been shown to generate alpha-brain waves similar to those achieved through meditation, thereby promoting relaxation and tranquility without sedation. Theanine is also believed to encourage sound and restful sleep. L-theanine, capsule: hydroxypropyl methylcellulose (carrageenan*); bulking agent: cellulose; anti-caking agent: silicon dioxide; anti-caking agent: magnesium stearate*. Adults: Take 1-2 vegicaps a day, between meals. Children over 8 years: Take 1 vegicap a day, between meals. Below are reviews of Higher Nature Theanine - 90 x 100mg Vegicaps by bodykind customers. If you have tried this product we'd love to hear what you think so please leave a review.